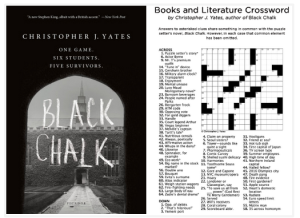 To celebrate the US launch of Black Chalk (Aug 4), I’ve compiled a crossword puzzle with a literary/Black Chalk theme. You can download the pdf from Picador’s tumblr, just click here. Please make a clearer, bigger version of the crossword puzzle. Just click on the word ‘here’, Stacy. That will take you to a page with the option ‘ Download the PDF here.’ Click that, and you’ll have the full version of the crossword.